During ITER operation, high-powered lasers will gather important diagnostic information on the properties and behaviour of the plasma, such as density, temperature and internal magnetic field. An integrated safety system will ensure that the lasers operate safely in all circumstances, including the unexpected. The safety system for the lasers moving between the Diagnostics Building and the vacuum vessel consists of several layers, including physical barriers and instrumented interruption functions, explains diagnostic physicist Christopher Watts. Lasers are common objects in our daily lives, found in CD/DVD players, office printers, the computer mouse, and laser pointers. But the lasers employed in ITER's diagnostic systems, according to diagnostic physicist Christopher Watts, are "about 100,000 more powerful than a laser pointer." High-powered laser beams generated in the Diagnostics Building will be relayed by a series of mirrors along beam tubes through the galleries and port cells into the vacuum vessel. There, they will focus on various locations inside the plasma to obtain the needed data and return to the Diagnostics Building with their precious information. Because unprotected laser beams—many radiating in the invisible spectrum—could be hazardous to the human eye, the beams are enclosed in metal pipes along the entire transmission line. But safety must be ensured even in the case of an accidental or unexpected breach in the laser enclosure. Watts has been working with occupational safety engineer Roger Victori from the Control System Division to develop a reactive safety system that can respond in all situations (normal or accidental) and during all phases (operation, servicing, alignment). "We have developed a several-layer system that includes physical barriers as well as instrumented interruption functions," Watts explains. In order to test the safety features of the system, they developed a tabletop mockup that employs a low-powered laser that is safe under all conditions. The mockup mimics the lasers' journey between the Diagnostic Building and the vacuum vessel, simulating the key elements of dormant safety measures that spring into action when a breach in the laser enclosure triggers an alert. The mockup's controls and sensors are coupled to an automated logic system controlling the safety aspects. These measures include automated laser beam "blocks" at various locations along the transmission path that can engage to keep the laser confined to a certain region. If physical shielding is insufficient to mitigate the safety risk, electrical actuators interrupt the electrical power supply, shutting the laser down. Already the mockup has proven useful, as it has helped identify key safety and operational interdependencies. 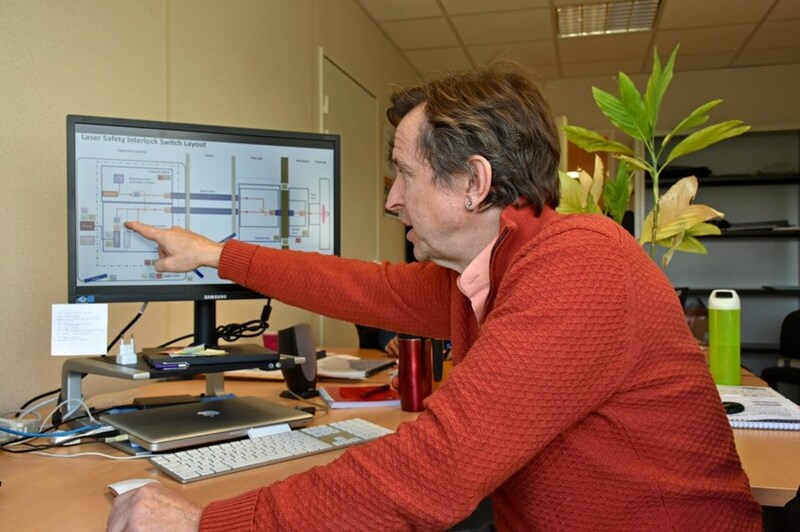 Once the logic and specifications of the safety functions are worked out in detail, the mockup safety system will be provided to the laser diagnostic suppliers as an example of a system that meets ITER's safety requirements.